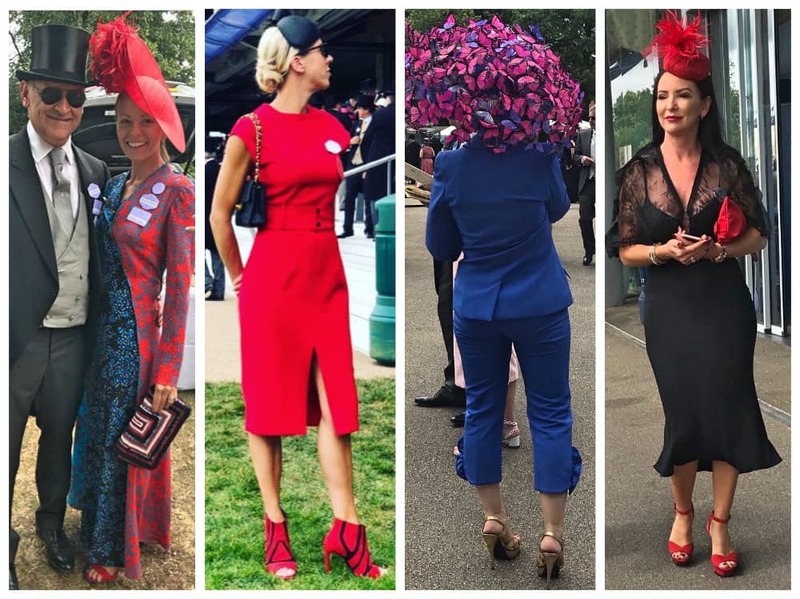 The inside track on Royal Ascot 2018 from hats, horses and the hottest royals. Spoiler alert! Harry and Meghan steal the show. 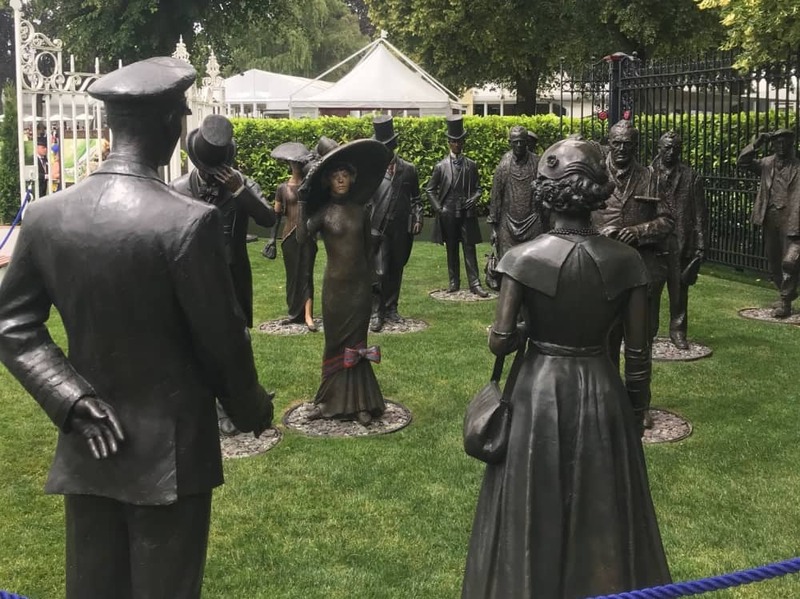 ARTY ASCOT: The equine sculptures steal the limelight here, but this is my fave – Uniting Two Societies depicting the Queen and Prince Philip meeting racegoers. It feels like only yesterday since my feet stopped hurting from the last Royal Ascot – vertiginous heels were a mistake. Of course 2017 was a scorcher and I melted faster than a Solero in the desert, but this year the going was good. So frocked up, headpiece neatly perched and I’d convinced myself that I’d nailed the comfy shoe option (I didn’t). Here’s the the down low on Royal Ascot 2018. HOT TO TROT: Left to right, Jax Jeans women’s boutique owner Jax Meehan in Diane Von Furstenberg; Georgie Hoffman of Field & Frolic in Zara and Balenciaga shoes, Natalia Tutus with a swarm of butterflies and you can;t beat going back to black with red accessories. Whereas last year was all about the headpiece (no less than a 4cm base to get into the Royal Enclosure – you can utter the F word elsewhere), big hats and satellite dishes were in abundance. 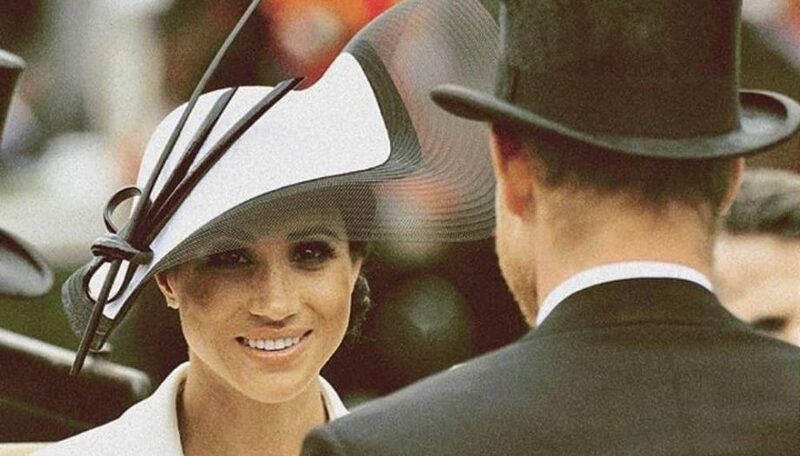 Great for keeping the sun out of your eyes, not so great for the person behind you *coughs* who can’t get a glimpse of Meghan and Harry because your millinery can been seen from space. There was a lot of black and white, reds, plenty of jumpsuits and maxis (probably couldn’t be figged to shave their legs) and metallic heels. It may have been monochrome’s day but it was the bold and beautiful that made it into the winner’s enclosure. Jax Meehan, owner of Muddy fave Jax Jeans in Hungerford was stunning in this lush Diane Von Furstenberg print dress and dramatic red hat from Lizzie’s Hats (the fella is racehorse trainer hubby, Brian); Georgie Hoffman of Field & Frolic went for a cheeky Zara number with my fave shoes of the day by Balenciaga; milliner Nataliya Tutus was hard to miss in this butterfly effect hat and you cannot beat classic black – gorge red hat too form a racegoers who in such a rush to get to the Champagne bar, I didn’t get her name. WHY SO SERIOUS? Despite the face, it was a great first day at Royal Ascot. This is my I’m who am I going to best on and my feet hurt face. 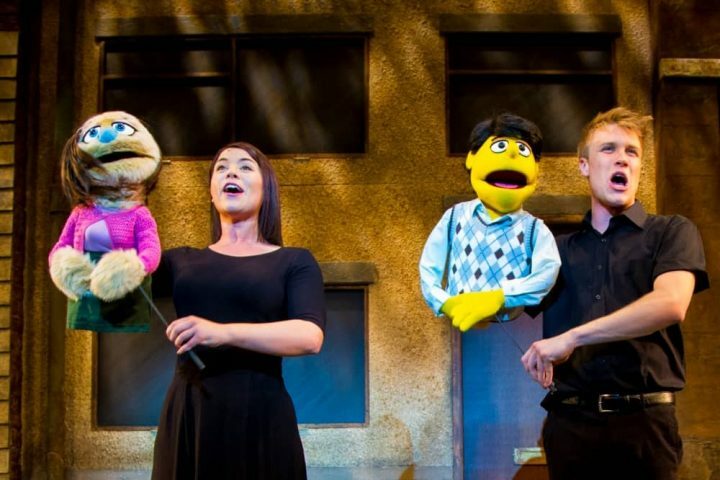 Note to self… cheer the heck up. Butterfly hat looks cute though. Me? 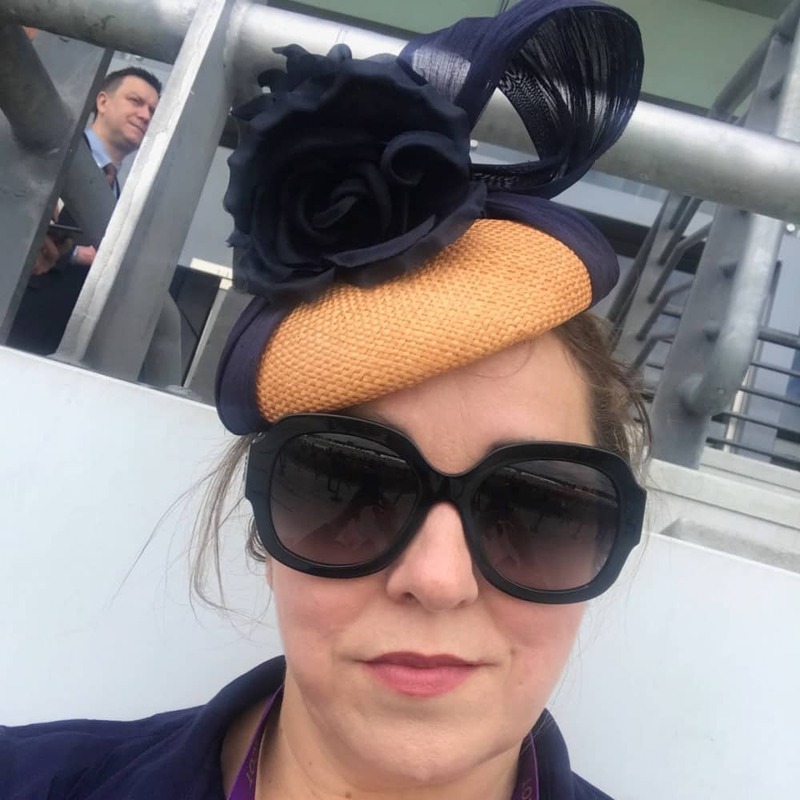 Well I borrowed my headpiece from the very talented Michelle at Butterly Hats in Lambourn – she made the hats for Downton Abbey, no less, and trained with iconic milliner Jane Corbett (name checks Duchess of Cambridge). All her designs are totally bespoke and she works alongside Angela Denton who specialises in the bigger pieces. 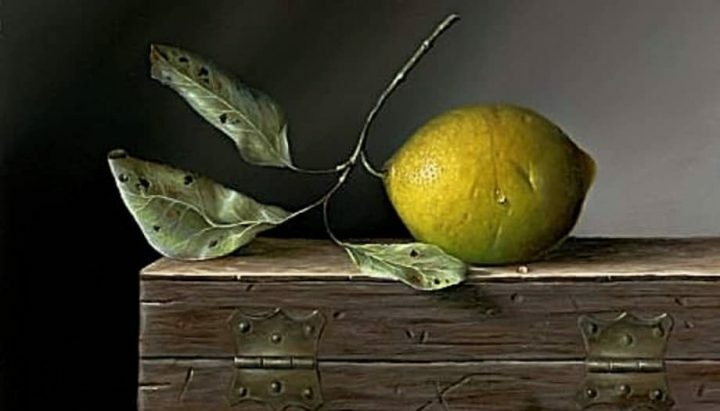 Anyhow, check them out. They’ve just open their new showroom on the high street. Who gets the loudest cheer? I’d love to say the winners, but the Royals are the headliners. The Royal Procession, to the soundtrack of the Royal Cavalry military band, roll down the racecourse with the Queen, wearing acid yellow, leading the pack. You can always rely on Ma’am to be on bang on trend. The biggest cheer came when newlyweds Prince Harry and Meghan came into view, sharing a carriage with Prince Edward and Sophie. Meghan got the black and white memo wearing a white Givenchy dress and monochrome Philip Treacy hat. These two are rock star royals and everyone wanted to catch a glimpse of this glam couple’s first outing at Royal Ascot. Not sure if Meghan’s remotely interested in racing, but she can certainly carry off a posh outfit. Princesses Beatrice and Eugenie, Charles and Camilla, Anne and Andrew were also there but didn’t really get a look in. Soz. Chances are you’ll have spanked all your cash on a new outfit, so food is not going to be top of the to do list. That said, you’re going to need something to soak up all that Champagne. Car Park 1 is the place to luncheon, but your chances of tucking into smoked salmon and strawberries are slim. It’s harder to get a spot in here than your child into Eton – double barrelled name and billions in the bank or not. Many pay to park elsewhere in order to lay their starched table cloth on a picnic table in advance of the racing. Yes there are horses, but I’d argue there’s more peacocking, eating and drinking than anything else. My top tip take your own picnic or pre order a Fortnum & Mason Hamper (£95 for 2). You can book a table in one of the restaurants but expect to pay about £100 per head. This is not a cheap day out – expect to spank some cash and hope you’ll win some of it back. A bit like being at a service station, you’re a hostage to the pricing. A G&T from the Juniper Gin Bar was £10, burger and chips £9.50 and wine was £6 a glass in the Queen Anne Enclosure. Hit the Bolly stand and you could get into all sorts of trouble. Bolly start at £52. 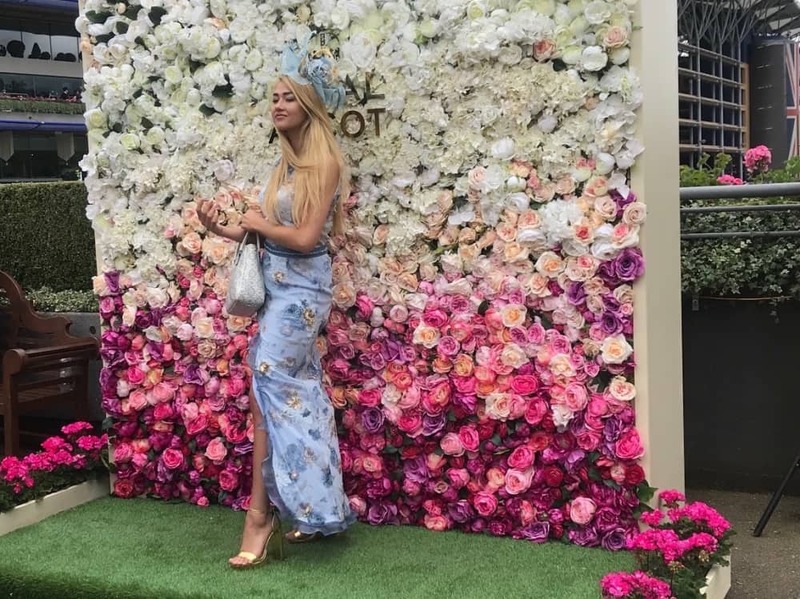 In recent years the racecourse has erected an Insta-worthy floral wall (very Kim and Kanye) for people to snap their selfies in all their splendour (before the feet start screaming and fizz gives you a fuzzy head). It’s really priddy, but the queue was not. When you’re 30th in line for a photo op, you tend to shimmy on and hit the bar instead. You’ll catch a glimpse of celebs all week. If they’re stopping to have their pic snapped by the media, I reckon it is ok for you to grab one too. Apparently there are horses racing and it’s a pretty big deal. You don’t have to know anything about the sport to have a flutter. Pick a name, colour, horse or jockey you like the look of and have a bet. Frankie Dettori was back in the saddle after a shoulder injury prevented him from riding last year. 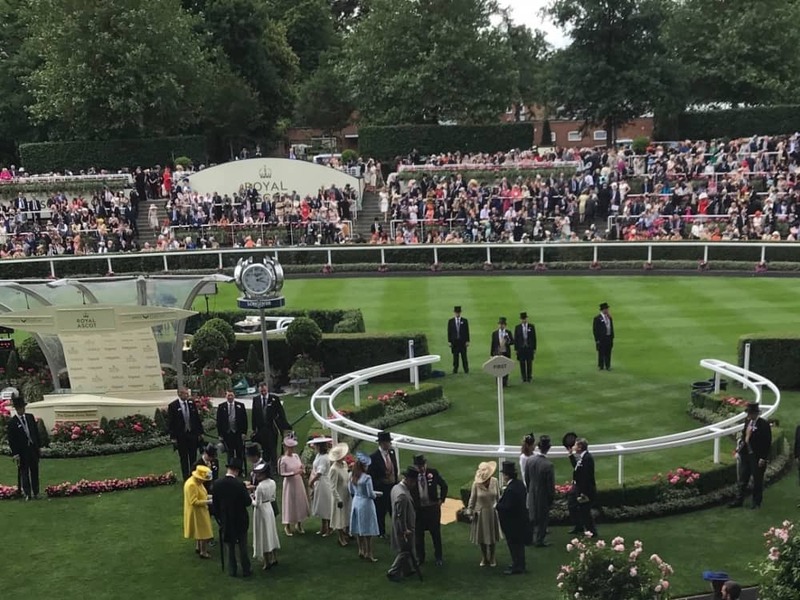 It was great to see Blewbury trainer Eve Johnson Houghton get her first ever Royal Ascot winner with Accidental Agent (owned by her mum and named after her grandfather). 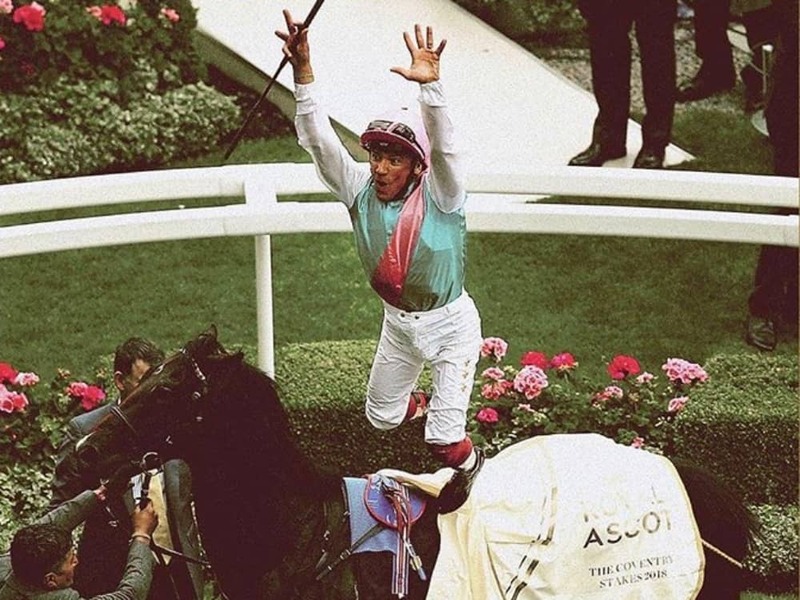 Oh, and it wouldn’t be Ascot if Frankie wasn’t leaping out of his saddle to get his hands on his trophy – even if he did mistake it to be the Duchess of Sussex. Cheeky. Give yourself plenty of time to get there, the trains are rammed, the roads are chocca. It always takes ages. You’re will haemorrhage money. Outfit, ticket, food, drinks and a flutter don’t come cheap. 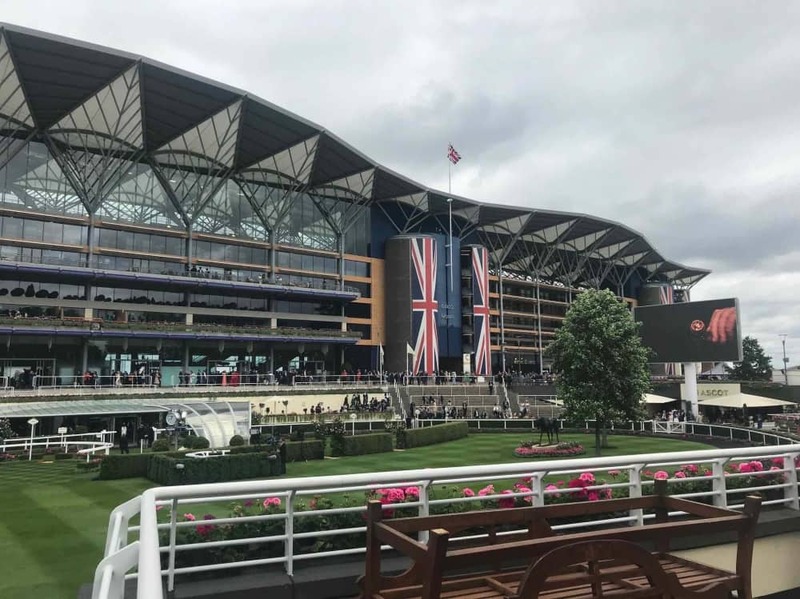 One racegoers reckoned they spent about £750 for a day in the Royal Enclosure. There are cheaper tickets, but be prepared to sell a kidney if necessary. Most places inside take cards, the touts take cash only but there are lots of cash machines, so don’t panic. For the first time in your life, the queue for the ladies loos will be shorter than the men’s. True. Wear comfy shoes. You do a lot of walking (at least I did). So much, in fact, I reckon I qualify for a Duke OF Edinburgh Award. There’s nothing stylish about going barefoot, so if you have gone for cool over comfy, pop a pair of flats in your bag. Dirty trotters will be heading in one direction only and that is the Mail Online sidebar of shame.